Nadine Epstein at Wadi Attir. When I was in Israel in late 2013, I drove across the rugged expanse of the Negev on Route 31. At the time, Israeli newspapers were full of articles describing highly controversial demolitions of Bedouin homes and villages, failed plans to resettle the Bedouin, and ongoing tensions between the Bedouin and the Israeli government. I could see some of the demolished homes from the road—mounds of broken cement and protruding metal wire. The rubble piles sat besides intact homes—some nice, others less so—most noticeable for their satellite TV dishes and their haphazard arrangement along hills and valleys. I couldn’t help but think about how much had changed for the Bedouin—for better or worse—since I was a teenager traveling the very same road. Now most live in houses, not tents, and own trucks or travel on buses, not camels. There were far fewer herds of sheep and far more stores. Nearly all the men and women I saw waiting at bus stops along the highway wore Western-style shirts and pants or skirts, not traditional Bedouin garments. I was on my way to visit a project called Wadi Attir outside the Bedouin town of Hura. Set on 100 acres, it is a sophisticated $6 million agricultural and ecological experiment, the first of its kind to blend modern science and technology with traditional Bedouin knowledge and culture. The project was still in development and only one building was up at the time, but the land was graded and the roads paved. I walked with Bedouin project manager Younis Nabbari out into sandy fields—interlaced with intricate irrigation systems—neatly lined with rows of hybrid plants developed by a special team at Ben-Gurion University’s Jacob Blaustein Institute for Desert Research in Beer Sheva, that would be used to make teas, creams and medicinal products. Nabbari showed me thousands of tree saplings that would help make the soil fertile as well as grazing pens for sheep and goats, so that cheese and other niche dairy products could be made. “We want to take Bedouin tradition—for example, the ecological balance based on natural grazing and reusing water—and make it a more large-scale operation with adaptations that don’t overwhelm tribal tradition and won’t disturb the culture,” Nabbari told me. Among those adaptations are a world-class technological infrastructure designed to renew arid land with soil enrichment, water reuse, minimization of waste and transformation of waste into resources using renewable energies such as solar and wind. The project is the brainchild of The Sustainability Laboratory, a U.S. nonprofit organization working in partnership with the Hura Municipal Council, an Israeli government consortium led by the Ministry of Agriculture and Rural Development, the Jewish National Fund-USA and various other individuals and foundations. In the works for seven years, it has been designed to avoid the pitfalls of previous projects and settlements, in the hopes of preventing further erosion of Bedouin culture and sidestepping, perhaps even healing tribal fractures. It is located on land made available by the government—and unclaimed by any tribe—so that all Bedouin can participate. Women, too, can participate in culturally acceptable ways, such as making dairy products and raising medicinal plants, as well as learning skills that can be applied to home gardens. “This is a way for Bedouin to adapt to Israeli society without losing identity and to be self-sufficient, as well as to develop skills of new middle- and long-term planning—and at the same time helping Bedouin reclaim some of traditions we have lost over the last decades,” says Nabbari. It is no accident that the project is based near Hura. The town’s mayor is Dr. Muhammad al-Nabari, a chemist and one of Wadi Attir’s founders. “For us, Wadi Attir is a new approach to economic development,” he says when we meet at Hura’s modern municipal office complex. “We want to show that we can do things in another way.” That new model includes an educational component. The project includes visitor and education centers to house programs about ecology, sustainability innovation and entrepreneurship for Bedouins and Jews. Even tourism is part of the vision, since Wadi Attir is adjacent to Route 31, a popular route to the Dead Sea now being widened to a four-lane highway. The Bedouin have been very involved in every step of planning. 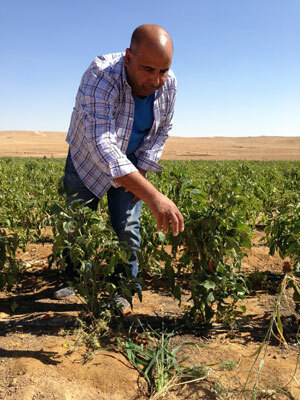 Dr. Michael Ben-Eli, the founder and director of The Sustainability Laboratory, says that Wadi Attir is a collaborative effort by groups of people who rarely work together—not just Jews and Bedouin but intra-Bedouin. “There are people from different tribes and from all the different kinds of Bedouin habitats—from recognized villages to unrecognized ones,” he says. The founders are both men and women, and members of both genders are part of the team. “This is not easy,” says Ben-Eli, explaining that although there are now more women activists in Bedouin society, usually groups of women work with other women. Since my visit, there have been bureaucratic snafus, but Ben-Eli is delighted with the progress. Many of the buildings are completed, medicinal plants are ready for harvest, and the first group of baby sheep will soon be born. Products are being developed, and the women-led vegetable program is growing and distributing seeds. With the ecosystem restoration program in place, biodiversity is improving: Birds and animals, including foxes, are reappearing in the area. Wadi Attir is an island of idealism and hope, surrounded by a region of complicated realities. In this issue, our Israel correspondent Eetta Prince-Gibson explores these realities in two stories that are part of Moment’s ongoing series on Israel’s Arab citizens. Prince-Gibson visits Umm al-Hiran, a Bedouin village slated to be demolished to make room for a Jewish settlement on the same site. As always, we go beyond the headlines to explore the context and sweep of the six-decade relationship between the Bedouin and the Jewish State. Her second story delves into lives of Bedouin women, who are more educated than ever but remain constrained by tribal tradition—and are more likely than ever to be pushed into polygamous marriages. These are important stories illustrating the challenge Israel faces as a home to diverse peoples. America is also home to diverse peoples, with similar ongoing challenges. In this issue, we commemorate two successful steps: the 1964 Civil Rights and 1965 Voting Rights Acts in “A Great Civil Rights Partnership,” a photo symposium featuring interviews with John Lewis, Barney Frank, Julian Bond, Eleanor Holmes Norton, Susannah Heschel and others. There is so much more good summer reading as well—stories and reviews about books, music, art, food—and even a sojourn into real estate history. Enjoy!